England opener Jason Roy scored his third T20 hundred as Surrey proved too strong for previously unbeaten Sussex Sharks at Hove. The 25-year-old made 109 from 67 balls to underpin a commanding total of 205 for 4 after Surrey had batted first. Surrey’s overseas pair Kumar Sangakkara (54 off 31 balls) and Dwayne Bravo (30 off 14) gave Roy excellent support and Sussex were always struggling after losing two wickets in the first two overs. Ross Taylor made 51 but the Sharks finished short on 182 for 5 and lost by 23 runs. This was Roy’s night, though, as he mixed authentic shots with eye-catching improvisation which left the Sussex bowlers struggling to find a way of containing him. He hit 16 fours all around the wicket and a six off the South African David Wiese before holing out to deep mid-wicket in the final over. Surrey lost Steven Davies (3) in the fourth over but the experienced Sangakkara was the perfect foil for Roy. He took a particular liking to Wiese, hitting him for two fours and a six off successive balls in the 11th over which cost 17 runs. Sangakkara reached his 50 in the 15th over and celebrated with two ramp shots for four off Ajmal Shahzad before falling lbw trying to repeat the stroke off the next ball. That brought Bravo, on his Surrey debut, to the wicket and he wasted little time in finding his range. The pick of his shots was an effortless inside-out drive off Tymal Mills over the extra-cover boundary for six before a comical moment in the same over his bat flew 30 yards out of his hands as he tried to clear mid-wicket. It was a chastening night for Mills, who had been so impressive in Wednesday’s win over Somerset as his four overs went for 55. England’s Chris Jordan did pick up Roy and Bravo off successive balls in the final over to finish with 2 for 35. Sussex’s chase never got sufficient momentum. Chris Nash, who had scored his maiden T20 hundred 48 hours earlier, toe-ended his third ball to mid-on to give Sam Curran a wicket on his 18th birthday and Ben Brown upper-cut to third man off Tom Curran in the next over. Their most experienced batsmen, Luke Wright and Taylor, revived Sussex hopes by putting on 88 in 10.3 overs before Zafar Ansari struck two decisive blows in the 13th over. 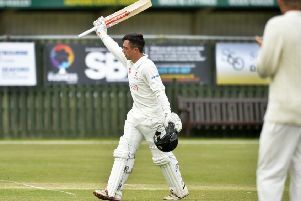 An unusually subdued Wright (34 from 30 balls) holed out to deep mid-wicket and Taylor, whose 51 from 36 balls included three sixes, was smartly stumped down the leg side by Gary Wilson. That left Sussex needing an improbable 99 off seven overs and although Jordan made 30 off 23 balls it was Surrey’s – and Roy’s – night.